Due to come out later this spring, First Steps in Valuing Trees and Green Infrastructure will focus on the basics built environment professionals need to know to make the most of available approaches for valuing trees and other green infrastructure. It will introduce the scenarios where valuation can be used as a mechanism to deliver a positive change in the way that policy, investment, design and management decisions affect environmental assets. It will also provide a range of questions, tips and tools to consider when embarking on a valuation project and offer some case studies illustrating good practice. If you would like to be notified by email when First Steps in Valuing Trees and Green Infrastructure comes out, please register your interest ​here, and simply enter "First Steps" as the email subject. An impressive cohort of specialists, many of whom are contributing to the Futurebuild Urban Infrastructure seminars, will be at the TDAG stand at specified times each day (5-7 March 2019, ExCeL, London) to discuss their work and answer questions on a one-to-one basis. The topics under discussion cover all aspects of trees in the urban environment ! It's the perfect opportunity to raise any query you may have, and learn about the latest research and good practice. Download the programme here to plan your visit! The development of this additional utility was one of the main requests we received following the Guide's release. So we're delighted to have been able to provide this extra alongside an updated version ( V1.3) of the Guidance document, featuring minor corrections and amended icons for greater clarity. 19/09 seminar recordings: How do we value trees & other green infrastructure in the urban environment? Paul Nolan OBE (Mersey Forest) - on the GI-VAL Toolkit. Audio recordings of the presentations and slide decks are available here. Please do not copy information from the presentations without the permission of the author, or reproduce this link without permission from TDAG. TDAG's new digital guide on tree species selection for green infrastructure is now available to download. The aim of this guide is to enable more appropriate tree selection for a wide range of urban planting sites. ​The guide features some opening chapters capturing the latest evidence on how best to approach tree species selection to maximise the benefits bestowed on nearby communities while creating a more sustainable urban forest for future generations. Specific information on over 280 trees, illustrated with over 800 photographs, is included in the Tree Profiles section. A Tree Selector tool also helps identify candidate trees by a range of criteria. Click here to download a free copy of the guide and watch a video presentation of its content. Following his retirement as a trustee, we are delighted that Sir Terry Farrell has agreed to be TDAG’s first Patron. Our March seminars offering a preview of TDAG's upcoming Species Selection for Green Infrastructure: A Guide for Specifiers were sold-out, and with waiting list...but fortunately, the London event was entirely filmed! Don't miss Dr Andy Hirons and Dr Henrik Sjöman (the two lead authors of the guide) explaining how contemporary research and greater understanding of ecophysiology is shifting approaches to species selection, and how the upcoming TDAG guide will convey this information. The YouTube link provided on the right includes a playlist of three videos covering the whole programme of presentations offered on the day. What a great ecobuild and what a rewarding interest in all aspects of trees along with green and blue infrastructure. We would like to thank our sponsors (Barcham, Capita Lovejoy, GreenBlue Urban, InfraGreen and Myercough College), all the TDAG members who manned the stand and provided their specialist expertise and all those at ecobuild who spent time talking to us. Many thanks to all. The trees (courtesy of Barcham) that were featured at the stand are now going to a Trees for Cities project and a Bankside Open Spaces Trust pocket park at the Marlborough, while the display boards will now go on tour, starting with the two (sold-out) seminars we are organising next week in London (13/03) and Birmingham (15/03) on TDAG's upcoming Species Selection for Green Infrastructure: A Guide for Specifiers. This short interview with Professor Rohinton Emmanuel held at the TDAG stand demonstrates the importance of the two way interaction of green infrastructure and the built environment – highlighting the need for cross-disciplinary working and knowledge. Several TDAG members are contributing to the Green & Blue Infrastructure seminars featured as part of the ecobuild Knowledge Programme and will make themselves available at the TDAG stand (H130) at specifed times each day to discuss their work and answer questions on a one to one basis – Find the TDAG stand programme here and the ecobuild Knowledge Programme here. First Steps in Urban Air Quality: For Built Environment Practitioners (available now)– What are the basics that built environment practitioners need to know about urban air quality? Professor Rob MacKenzie and Dr Emma Ferranti from the University of Birmingham will be presenting the guide at the ecobuild Green & Blue Infrastructure seminar on 7th March from 13.30-14.45 and will then answer questions at the TDAG stand from 15.00-16.30. Species Selection for Green Infrastructure: A Guide for Specifiers ​(to be released in April) – how can we improve species selection so that we can provide our towns and cities with diverse and resilient palette of trees that are capable of thriving in challenging urban environments? Dr Andrew Hirons will be presenting the guide at the ecobuild Green & Blue Infrastructure seminar on 8th March from 12.00-13.15 and will then answer questions on the TDAG stand from 13.45-14.30. New seminar: Selecting species for a better urban treescape: 13th March, London | 15th March, Birmingham - Book today! How can we improve species selection decisions? In May 2016 Myerscough College and the University of Lancaster received a Natural Environment Research Council (NERC) grant to explore this question. They partnered with TDAG to turn their findings into a new guide – Species Selection for Green Infrastructure: A Guide for Specifiers. Ahead of the launch of the guide later in the spring, we are organising two seminars – one in London (13th March) and one Birmingham (15th March) – to share the evidence and practical recommendations stemming from this work, and provide a preview of the content of the upcoming new guide. Both events feature a one-day programme of expert speakers and specialist arboricultural trade stands. Early bird reduction applies on bookings made prior to 18th February – make the most of it! What are the basics that built environment practitioners need to know about urban air quality? Read our new guide! What are the basics that built environment practitioners need to know about urban air quality? It is recognised that air pollution is the biggest environmental risk to health. The design of our urban infrastructure – including green infrastructure – determines where air pollution is produced, and how it disperses. It is important to dispel myths and work with evidence in understanding air quality which built environment professionals should consider at all stages of urban design and development. *First Steps in Urban Air Quality: For Built Environment Practitioners. A Trees and Design Action Group (TDAG) Guidance Document. UK: London. Ferranti, E.J.S., MacKenzie, A.R., Ashworth K., and Hewitt C.N. 2017. We are very pleased to announce that Jeremy Barrell has agreed to become a TDAG trustee. The aim in appointing trustees is always to find the very best person for the role and we are sure that you will all agree that Jeremy will make a very positive contribution to the Trust’s work. The London Tree Officers Association (LTOA)'s Planning Working Party has released a new resource compiling suggestions for the wording of robust planning conditions related to landscaping, arboricultural supervision, tree protection, tree planting, tree pruning, and woodland management. The conditions detailed were not written to be standard conditions as there are few standard situations where they could be directly cut and pasted. They are a starting point, to be altered and changed to fit specific circumstances as seen fit. The LTOA Planning Working Party intends to keep updating this resource based on its on-going discussions on good practice and real-life cases experienced by the officers involved, as well as on feedback submitted by users via the LTOA Forum or email. The LTOA Planning Condition resource is available for free from www.ltoa.org.uk/resources/planning-conditions. On Friday 23rd June, the London Tree Officers Association (LTOA) released a new best practice guidance document: Surface Materials Around Trees in Hard Landscapes. A key challenge for those responsible for selecting materials around trees is to balance the needs of the tree (permeability for air and water) with the needs of the footway (a safe, robust surface). Different professionals – tree specialists, highway engineers, landscape architects etc. – may have different ideas as to the right material to use in any given situation. The intention of this new document is to demonstrate that a wide range of materials is available; each has its advantages and disadvantages and no single material is right for every scenario. This document has been developed in association with a range of stakeholders including tree specialists, project managers and highway engineers, and is to be used as guidance for anyone involved in the selection of surface materials. The document was produced by the LTOA Surface materials around trees in hard landscapes Working Party and the design and layout has been kindly sponsored by GreenBlue Urban. Chair John Parker will be presenting the new publication at the forthcoming LTOA seminar to be held in Barnet on July 11th. Surface Materials Around Trees in Hard Landscapes is available free from the LTOA (www.ltoa.org.uk/resources/surface-materials- around-trees). ​As part of Milton Keynes reaching its 50th birthday this year, David Lock Associates has created a special website (www.mk50trees.com) dedicated to the beautiful trees in the Borough. The ‘New City’ of Milton Keynes boasts over 5,000 acres of parkland, rivers, lakes and woodland including over . The website ‘MK50 Trees’ maps out the location of 49 trees across the Borough - nominated by staff at DLA who have worked and lived in the area for many years - for either their location, uniqueness and aesthetic qualities or personal memories they may hold. The website allows users to search through a gallery of photographs to spot a familiar or interesting tree or they can simply select a location on the interactive map. There they will find facts about species, history and traditional uses, information about the location in which it grows, plus a personal story as to why it has been chosen. The TDAG guides win the 2016 Landscape Institute Award for Policy & Research: We are so proud!! "The guides encourage a collaborative approach across the planning, design and engineering professions"
​This work wouldn't have been possible without the continued support from CapitaLovejoy and Martin Kelly, who set-up TDAG as a collaborative forum, and continued to provide some core funding to enable its development. We have new projects now in preparation..., which we believe will be award-winning as well: visit our VirginMoney Giving page to become a sponsor! A call for papers has been issued for a major triennial international urban trees research conference. Trees People and the Built Environment 3 (TPBE 3) will take place on 5-6 April 2017, at the University of Birmingham, and follows on from acclaimed events in 2011 and 2014. This year the conference will focus on two significant areas of research; Roads to Place - Why trees are an integral part of highway transport design on Day 1 and The Health Crisis – the role of trees in improving human health (Mental, physical, social and cultural) on Day 2. Click here for more details. Thanks to VAL'HOR, the umbrella organisation representing the landscape and horticulture sector in France, Trees in Hard Landscapes: A Guide for Delivery has been translated into French and was launched on Tuesday 31 May at the 99th French Congress of Mayors. After a send-off by London Mayor Sadiq Khan, an 8-strong team led by the research and knowledge UK Charity Fund4Trees has cycled all the way from London to Paris to come and present the translated version to representatives of the French Association of Mayor's Environment Committee. To download the french version, click here or on the cover image left. Selecting appropriate species for a planting scheme is fundamental to its long-term success. As part of a knowledge exchange project funded by the Natural Environment Research Council (NERC), Myerscough College, Lancaster University and TDAG are collaborating to develop robust guidance on tree species selection for urban environments. For more background on this project, see our Research page. To inform this work, we have put together a short survey to collect information on current practices in tree selection and priorities for future tree selection guidance. Make sure to take part by following the link below. Please also help us spread the word to your colleagues and contacts, encouraging them to take part - this survey will take only 5 minutes to fill! ​At the end of May, the London2Paris charity ride organised by Fund4Trees in partnership with TDAG and key other national arboriculture organisations will "deliver" the newly completed french translation of Trees in Hard Landscapes: A Guide for Delivery to a high profile audience of French local elected officials gathered at the 99th French Congress of Mayors to be held Porte de Versailles, in Paris. The translation of the guide was made possible through funding provided by VAL'HOR, the umbrella branch organisation for ornamental horticulture and landscape in France. For more details, see our press release. RESEARCH: TDAG & academic partners awarded grant to explore 'Tree Selection for Green Infrastructure' - get ready to participate! Myerscough College, Lancaster University and TDAG have just been awarded a research grant by Natural Environment Research Council (NERC) to develop some guidance on tree selection for green infrastructure. Crucially, this project involves knowledge exchange. Therefore, there will be lots of opportunity for you to contribute to the outcomes of the project. The research results will then be used to develop some TDAG guidance on tree selection. It is hoped that this will be a valuable decision making tool for you to use when making tree selection decisions. Have a look at our Research page for more details on upcoming opportunities for participation (the first of these will be in the form of a survey of current selection practices). We will of course be posting some updates as the project progresses! ​WORKSHOP: How to approach the inclusion of trees in an MfS/MfS2-based Highways Design Guide? Last 17 February, 49 East-Midlands-based highways engineers, planners, tree specialists, designers and developers took part in “Roads to Places – integrating green infrastructure for highways” at the Nottingham Royal Concert Hall. Building upon the content of Trees in Hard Landscapes: A Guide for Delivery, this ICE- and CIHT-endorsed one-day workshop was organised by TDAG to facilitate an informed cross-disciplinary discussion among local Highways Authorities on how to make the most of trees and wider contemporary green infrastructure solutions in highways design. Having come together into a local partnership initially called the 6Cs, Derbyshire County Council, Derby City Council, Nottinghamshire County Council, Nottingham City Council, Leicestershire County Council, and Leicester City Council jointly issued in 2004 a Highways Design Guide to deal with highways and transport infrastructure for new developments in their areas. Despite numerous benefits since publication, the guide now falls short of embracing modern design principles and design processes. Creating a framework for stronger collaborative working with all stakeholders involved in the way residential developments are designed and built, including county and local planning departments, public health authorities, major house builders and developers, and special interests groups. The 17 February TDAG workshop offered the opportunity to explore the roles trees could play in supporting both the place and movement functions of highways, key success factor for achieving successful long term integration of trees and grey infrastructure, and delivery mechanisms – especially funding via commuted sums payments. The recommendations workshop participants identified in discussions together with the ideas and examples TDAG workshop facilitators raised in presentation make an informative read – all are captured in the workshop notes available here. Please feel free to circulate widely. The 17 February workshop was made possible thanks to the generous support of Nottingham City Council, who provided the venue free of charge and of Carbon Gold, Geosynthetics, GreenBlue Urban and InfraGreen Solutions, who covered food and refreshments, as well as provision of one hardcopy of Trees in Hard Landscapes: A Guide for Delivery for each delegate. MUST READ: A great deal can be learned from London's Green Infrastructure Task Force's recommendations! In 2014, London launched its first Infrastructure Plan 2050 to identify, prioritise and cost London’s future infrastructure. Green infrastructure is a key consideration in the plan, on par with transport, energy, water and waste. To build upon this work, the Mayor of London established a Green Infrastructure Task Force bringing together a wide range of interests and expertise to identify how to encourage a more strategic and long-term approach to investment in and delivery of green infrastructure. The Task Force report – Natural Capital: Investing in a Green Infrastructure for a Future City was released on 9th December. It identifies why long-term investment in green infrastructure is necessary, and the changes to policy, governance, valuation and funding that are needed to sustain the required investment... At a time when most major cities in the UK are gearing up to green their approach to infrastructure provision (Biophilic City Birmingham, Greater Manchester Natural Capital approach, etc. ), the London report provides city leaders around the country with a useful blueprint to go beyond declarations of intent, and tackle the issues associated with operationalising their vision. I-TREE ECO PROJECT: full report on the extent and benefits of London's urban forest now available! Valuing London's Urban Forest, the report presenting the findings from London i-Tree Eco Project, was launched on 2nd December 2015 at the House of Lord by Lord Framlingham, with warm support from Environment Minister Rory Stewart MP. The report can be downloaded here while the raw data is available here (scroll all the way down on the left to find the download buttons). The report puts monetary values to some of the benefits that London’s trees provide such as air quality improvement, flood attenuation and carbon storage. It also offers for the first time a comprehensive picture of the size, age structure and species composition of the London tree population, providing an unprecedented evidence base for future management. The report also calls for everyone to make their own contribution to protecting and enhancing London’s tree cover. This will help ensure that London continues to be a green city for future generations by planting trees in gardens, supporting tree planting by others, supporting organisations that promote and protect London’s trees. More information can be found on on the Forestry Commission's London i-Tree Project webpage and on the Treeconomics website (Treeconomics led the report writing). See also this Guardian article published on Monday 7th December 2015 by Patrick Barkham. CIRIA SUDS GUIDANCE: The updated SuDS Manual (C753) includes a chapter on trees! TDAG welcomes the updated SuDS Manual, which introduces a brand new chapter on trees! Trees and tree rooting environments can be used as key building blocks for sustainable drainage strategy, while improving quality of life and urban space by making them more vibrant, visually attractive, sustainable and resilient to change by improving urban air quality, regulating building temperatures, reducing noise and delivering recreation and education opportunities. The updated SuDS Manual (now C753) incorporates the very latest research, industry practice and guidance on SuDS delivery. To download your free copy, visit the CIRIA website. We filmed international guest speakers Dr Kathleen Wolf and Björn Embrén at our June 2015 seminars. Their inspiring lectures are now available for everyone to enjoy. Dr Kathleen Wolf gave a two-part presentation delving into the latest research available on the impacts of urban trees on people's health and on shopping districts. Björn Embrén, arboricultural manager for the Municipality of Stockholm, presented the award-winning 'Stockholm Solution' to cost effectively scale-up sustainable drainage solutions, reduce waste, provide renewable energy, and facilitate community participation while achieving healthy and lasting growth for urban trees in hard landscapes. 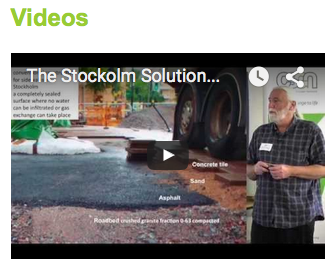 See on the right-hand side of our home page our new 'Videos' section. TDAG's first two seminars in Scotland held last 22 and 23 of June in Glasgow and Edinburgh attracted over 160 delegates from wide ranging professional backgrounds including civil and roads engineers, urban planners, landscape architects, architects, urban designers, transport planers, economic regeneration specialists, urban forestry specialists, etc.... There were rich discussions about ideas for possible next steps each delegate could take to make a difference and challenge the status-quo, emulating the principle that being successful at changing others often required changing oneself first. There was also a great appetite among attendees to be able to access the conference presentations materials and the references that came up in the discussions. These resources are available here. Greater Lyon Tree Charter: English version now available! The Greater Lyon Tree Charter is now available in English. The Charter was designed by the Greater Lyon Authority as a partnership-building tool to enhance the long-term management of trees across France's third largest city. It offers a set of common principles, together with a powerful rationale for action and a rich set of ideas for implementation for wide ranging audiences. So far, over 100 local and national stakeholders (including Greater Lyon's 59 boroughs, utility companies, the French equivalent of the UK's Landscape Institute, some tree nurseries, etc.) have signed the Charter, committing themselves to adhere to its Principles and to develop their own action plan for implementation. Both the approach and the recommendations featured in the Greater Lyon Tree Charter are highly relevant and directly applicable to the management of trees in towns and cities on this side of the Channel. Click here to download your copy. BOOK NOW: 'Better places, better infrastructure, better lives: Delivering real value with urban trees' seminars in Scotland! TDAG is organising two conferences on 22 June 2015 in Glasgow and on 23 June 2015 in Edinburgh to explore opportunities and delivery solutions for making the most of trees in hard landscapes in the Scottish context. With £10bn worth of infrastructure investment agreed for Scotland’s main 6 city regions, opportunities are at an all time high to set Scotland apart for urban livability with an integrated approach combining green, blue and grey infrastructure solutions. The 'Better places, better infrastructure, better lives' seminars will provide an unprecedented opportunity for a rich selection of speakers from diverse backgrounds (civil and highway engineering, urban planning and design, landscape architecture, architecture, horticulture, urban forestry, development management, research....) coming from the US, Sweden, France, Scotland and elsewhere to share and discuss their experiences of using of trees for enhancing infrastructure resilience and performance, attracting investment and making places that work. Delegates will also get a hard copy of TDAG's latest publication: Trees in Hard Landscapes, A Guide for Delivery (Sept 2014, 160pp). Click here for bookings and more details on the conference programme. CONSULTATION: Tree protection and Developments: We want to hear your views! TDAG would like to hear of your experiences in the delivery and management of effective tree protection as part of the planning process. Please respond to our call for submission no later than 5 June 2015. The type of submissions we are interested in include examples of both successful and weaker planning conditions supported with feedback on why these did or didn’t succeed (all information will be treated in confidence). In addition to looking at planning conditions we would also like to explore some specific project examples that have worked particularly well so that they can be used as case studies. TDAG will collate and review responses with a view to producing best practice advice as to how the weaknesses in the current system can best be addressed. How we can turn visions of a tree-rich ‘working’ city landscape into reality? 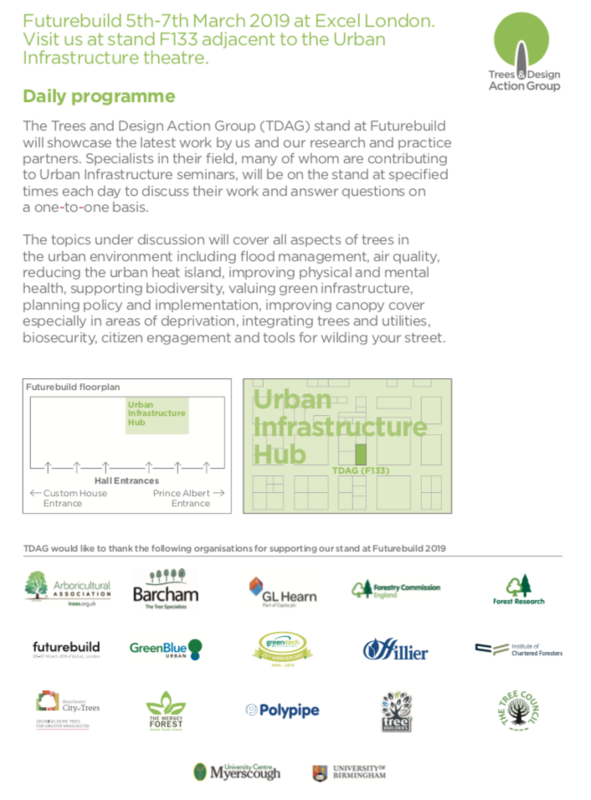 Organised by the Landscape Institute and TDAG at The Building Centre in London on 23/03 and 30/03 from 2:00pm to 5:15pm, these seminars will explore the latest research, technical solutions and project examples on the use of trees in streets and the wider public realm. The 23/03 event will focus on the new found relevance of trees to meet design ambition and enable enhanced project value. The 30/03 event will take a closer look at delivery issue, exploring the pivotal roles of below-ground design solutions and robust use of the planning system. Both event will draw from the content of Trees in Hard Landscapes: A Guide for Delivery. LORD FRAMLINGHAM CHAMPIONS URBAN TREES AT UK HOUSE OF LORDS: "Are we making the most of this incredible asset?" Lord Framlingham made a strong case for urban trees at the House of Lords on Thursday 15 January 2015 during a Natural Environment debate initiated by Lady Bakewell. Lord Framlingham called for a nationally coordinated approach to enhance the integration of trees in the design and management of hard landscapes. We were also very please that he commended TDAG's latest two publications and urged Lord de Mauley, Parliamentary Under-Secretary of State for the Department for Environment, Food and Rural Affairs (DEFRA) to "lend his weight to the distribution of these guides, or more particularly their contents, so as to co-ordinate and encourage the most enlightened and best practice everywhere". Less satisfactory was the lack of clear answer to Lord Framlingham's question on who has responsibility for urban trees at a governmental level. It would appear that, despite the interest and good intentions towards urban trees demonstrated during the debate, the central question as to who is actually responsible for ensuring the urban forest and all the benefits it bestows is managed in the present and is sustained and developed into the future, remains unanswered. The full debate can be read here (scroll down to time stamp 12:28pm to find Lord Framlingham's speech). Farrells and TDAG are very pleased to announce that Sir Terry Farrell is now a trustee of the TDAG Trust alongside Martin Kelly, Chair; Dr Mark Johnston, co-author of Trees in Towns II and Keith Sacre, Sales Director at Barcham Trees and lead author of the recent BS 8545:2014 Trees: from nursery to independence in the landscape. Our ﻿﻿﻿press release﻿﻿﻿ provides more details. 240+ participants attended Autumn 2014 Roadshow organised in November by the Arboricultural Association (AA) in partnership with TDAG. This series of one-day seminars in Exeter, Preston, York and Leicester explored the content of Trees in Hard Landscapes: A Guide for Delivery and BS 8545:2014 Trees: from nursery to independence in the landscape. The talks, exchanges of ideas and general discussion stimulated a thirst for action and, for many of those involved, a contagious sense of confidence that we, that is every individual, can make a difference. This article summarises what happened, and how you too, can bring about change. The release of TDAG's latest guide is accompanied by series of seminars and CPD training sessions due to take place all over Britain. These events are designed for highway, public realm, design and tree professionals as highly interactive, practical and cross-discipline workshops. A choice of seven dates is currently available for the autumn 2014, pending the release of the winter/spring schedule. More details on seminar dates and booking as well as free PDF copies of the guide are available here. TDAG welcomes requests for arranging additional training events based on Trees in Hard Landscapes: A Guide for Delivery. Inquiries should be directed to Sue James. Trees in Hard Landscapes: A Guide for Delivery was launched on 14 September 2014 at the Arboricultural Association annual conference held at Royal Holloway in Egham, Surrey. This new guide explores the practical challenges and solutions to integrating trees in 21st century streets, civic spaces and surface car parks, detailing process, design and technical options. It will be of particular interest to highway engineers, public realm professionals and tree specialists. ﻿﻿Click here﻿﻿ to download your PDF copy of the guide and learn about the CPD training sessions to be organised to facilitate its dissemination. The consultation period on TDAG's upcoming Trees in Hard Landscapes: A Guide for Delivery ended at 5pm on Friday 13 June, 2014. Thank you very much for your encouraging and thoughtful responses. The final publication date will be announced very soon. Check again on this page or on our ﻿Home﻿ page in a couple weeks for further updates. TDAG's new urban forestry guide, titled Trees in Hard Landscapes: A Guide for Delivery will be out for consultation from 28th May until 13th June 2013. Trees in Hard Landscapes: A Guide for Delivery will be of particular interest to highway engineers, public realm professionals and tree specialists. It explores the practical challenges and solutions to integrating trees in 21st century streets, civic spaces and surface car parks - detailing process, design and technical options. For producing this new guide, TDAG joined forces with the Chartered Institution of Building Services Engineers (CIBSE), the Chartered Institution of Highways and Transportation (CIHT), the Institution of Civil Engineers (ICE), and the Institute of Chartered Foresters (ICF), which have all been active members of the steering group reviewing and advising throughout the development process. Trees in Hard Landscapes: A Guide for Delivery has also benefited from the input of over 100 built environments professionals and organisations from wide ranging disciplines and sectors who have taken part in interviews, contributed case study materials and/or offered feedback on earlier drafts. The aim of the consultation is to build upon this work and focus on content: all suggestions for improvements are most welcomed. Page reference numbers as well as hyperlinks etc. will be finalised after the consultation period, when the final electronic and paper copy of the new guide will be issued. BOOKING OPEN: Trees, People and the Built Environment II - University of Birmingham, 2-3 April 2014. SAVE THE DATE: Managing the Urban Forest - Exeter University, 8 -11 September 2013 - The Arboricultural Association’s 47th Annual Amenity Arboriculture Conference. WORKING DRAFT FOR DISCUSSION: The Barriers and Drivers to Planting and Retaining Urban Trees. ones within urban areas.This was initially intended to support the Big Tree Plant. The draft Barriers and Drivers to Planting and Retaining Urban Trees report highlights potential solutions through recommendations from the Working Group and is intended to provide a platform for discussion with the relevant sectors that are perceived to be contributing to the barriers listed. It is hoped that the report will encourage constructive dialogue and assist in challenging some of the more entrenched issues around the provision of trees in urban areas. Members of the Working Group will be liaising with the various sectors and a final inclusive report will be published with, it is hoped, real progress being made in overcoming the issues raised. The recommendations highlighted can only be delivered through your active participation and co-operation and in due course the working group will be making suggestions on how this will done. If in the meantime you have specific questions about the report or its recommendations please contact TDAG member Jim Smith (see Contact Us). 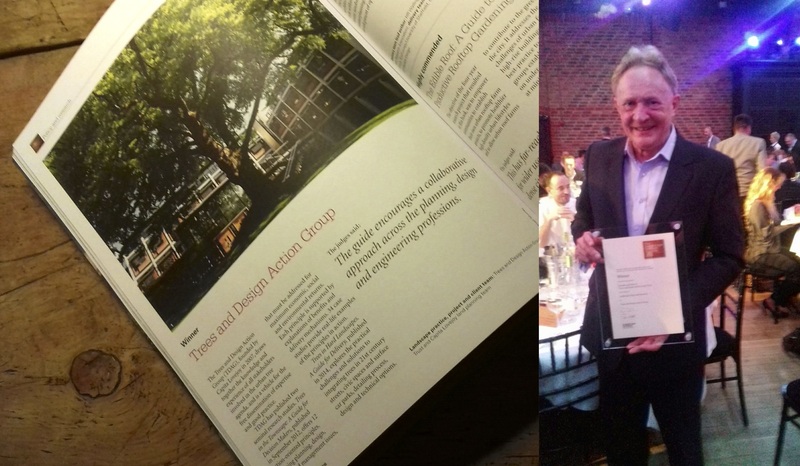 TDAG launched Trees in the Townscape, a Guide for Decision Makers on June 26th at the Royal Geographical Society. This new guide offers 12 principles of best practice for all those involved in local decision making to ensure that our 21st century towns and cities are underpinned by a 21st century approach to urban trees, for maximum economic, social and environmental returns. See our press release for more details. On launch day, the 12 principles of best practice promoted in the guide had already received 12 official endorsements from local authorities, local businesses or community organisations and social landlords as well as from government agencies such as the Forestry Commission! Launched alongside this new TDAG guide were Green Benefits, quantifying and valuing tree benefits in the Victoria Business Improvement District and Neighbourhoods Green’s online Tree Management Tool-kit for social landlords.Together, these three resources provide the basis for renewed momentum in the way urban trees are used and integrated as part of the infrastructure that makes places work.TDAG launched Trees in the Townscape, a Guide for Decision Makers on June 26th.